I love soft polenta. I make it often during the cooler months. It is substantial and satisfying.....a perfect accompaniment to stews, braises and hearty vegetable ragouts. I like firm polenta too (soft polenta that has been allowed to solidify)...but it isn't something I have been in the habit of preparing for my own weeknight table. Firm polenta requires a bit of advance planning (something I don't do a lot of for weeknight meals). 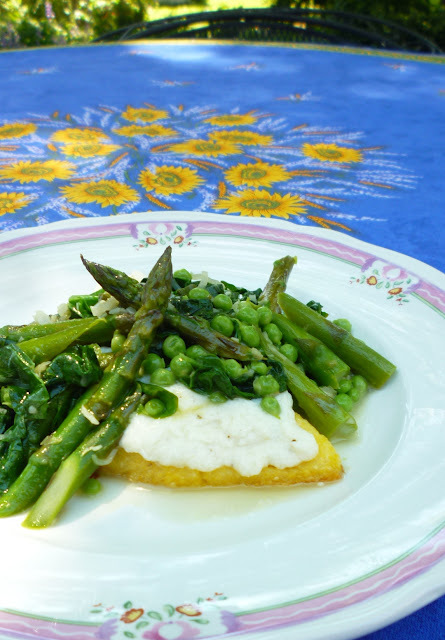 On the other hand, the fact that firm polenta must be prepared ahead makes it perfect for a formal dinner...or a private event through my chef service....so I make it often for those kinds of occasions. You can of course make both soft and firm at the same time—saving time and effort by preparing the foundation for a second meal while making the first. I'm not sure why I haven't been in the habit of doing this since there is absolutely no extra effort involved in making a large batch of polenta as opposed to a small one. It took having a rather substantial amount of extra polenta (destined to become firm for a formal dinner) to bring this rather obvious idea home to me. Rather than throw away what wouldn't fit in the pan for my dinner, I scraped the extra into an oiled pie plate, spread it out into a thick disk and set it aside in the fridge. As it turned out, I had enough firm polenta for two simple meals. We enjoyed both immensely. or a saucy stew-like preparation. David Tanis even makes it into an impromptu "pizza" with melted cheese and fried sage. The only trick is remembering to make extra whenever you make soft polenta. And if you are person who isn't crazy about leftovers...or eating similar things two nights in a row...the firm is different enough from the soft that it won't feel like leftovers or the same thing. In fact, you don't even have to eat it right away. When made with water (instead of stock), firm polenta will easily keep for several days in the fridge. We enjoyed the firm polenta so much I might even start making it occasionally just to have on hand—ready for a quick and simple meal. For each serving of firm polenta (depending on appetites) you will need to prepare 2 to 3 tablespoons of dry polenta—which will cook into portions of firm polenta weighing around 4 to 6 oz. To make firm polenta, scrape the finished soft polenta into an oiled pan or plate and spread into a 1/2- to 3/4-inch thick round or oval (round if you want wedges of firm polenta...oval if you want random shapes or rectangular slabs). Then chill (cover it with plastic wrap once it's cold) until ready to use. To serve, use a sharp knife to cut it into portions and either pan fry it in a little olive oil or butter in a non-stick or cast iron pan...or bake it in an oiled pan (again, I like cast iron) in a hot (425° to 450°) oven. You can also oil the polenta and grill it...which gives it a particularly nice look. You can of course make your soft polenta plain, but you can also dress it up with a little cheese and/or some minced fresh herbs, if you like. 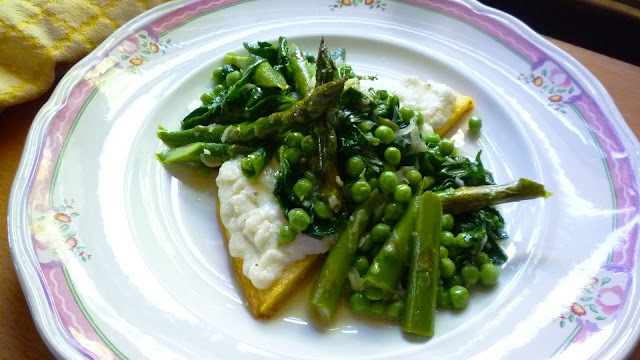 I served some of that first windfall of firm polenta with a medley of spring vegetables adapted from a recipe in Deborah Madison's Vegetarian Suppers. It was so good, I made it again last week so I could share it here. Madison serves hers on toast instead of polenta...and if you haven't had time to make polenta, I think toast would be wonderful. I also think this particular medley would be fantastic served with fish. 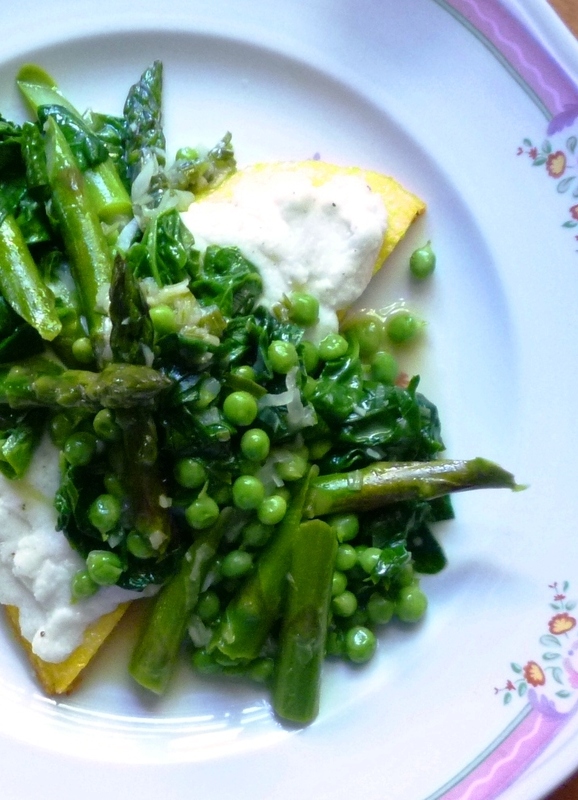 Madison's medley is made with just spinach and asparagus, but I have added peas. I love fresh peas....and they are a fantastic addition—adding sweetness and visual interest. The medley itself follows the simple formula I described in a post a couple of years ago. 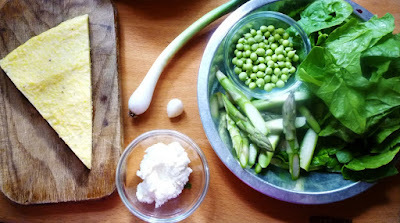 If you like, you can follow the instructions in that post and make this medley by blanching the asparagus and peas ahead. If you do this, make sure you save some of the blanching liquid to use when you finish the medley. One of the things I love about this particular recipe is the pale green broth—flavored with nothing but spring onions, green garlic, the vegetables and olive oil.... It is astonishingly flavorful. The recipe is obviously very flexible. You can alter the combination of vegetables...and the serving size...as much as you like. Just adjust the size of your pan accordingly...choosing a pan that will hold all the vegetables—not including the spinach—in a snug single layer. I have written the recipe with quantities for one (it makes a super nice solo meal). But if there are more of you, simply multiply the quantities to suit your number...and your appetites. The firm polenta is terrific with the delicate vegetables of this spring medley. It absorbs the light broth...and adds substance to an otherwise light dish. That said, I find that firm polenta is somehow less heavy than its soft counterpart...which makes it much more appealing as the weather warms up. 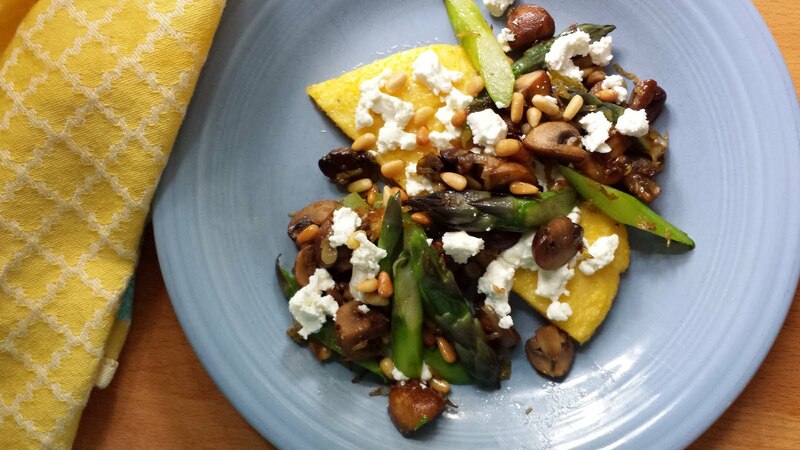 In fact, now that I've been reminded of how good firm polenta can be, I will probably make a point to occasionally make it during the warmer months. I'm certain it will make a fantastic partner for the vibrant vegetable sautés and sauces of summer. Place a cast skillet in a preheated 450° oven. While the onion cooks, brush the bottom (flat surface) of the polenta with olive oil and add to the hot skillet in the oven. Brush the top with olive oil. Place the pan in the oven. When the onion is soft, add the asparagus and enough water to come about 2/3 to 3/4 of the way up the sides of the asparagus (in my pan, this was about 1/4 c. water). Season with salt and bring to a boil. Reduce the heat and simmer, stirring occasionally until the asparagus is about 3/4 cooked, or "tender-crisp" (about 5 minutes). Add the peas and bring back to a simmer...continuing to cook and adding more water if the water level dips below 1/4 of the way up the sides of the vegetables. Cook until the asparagus and peas are tender....another 3 minutes after adding the peas. Taste and correct the seasoning. While the vegetables simmer, mix the ricotta with the pecorino and season to taste with salt, pepper and nutmeg. 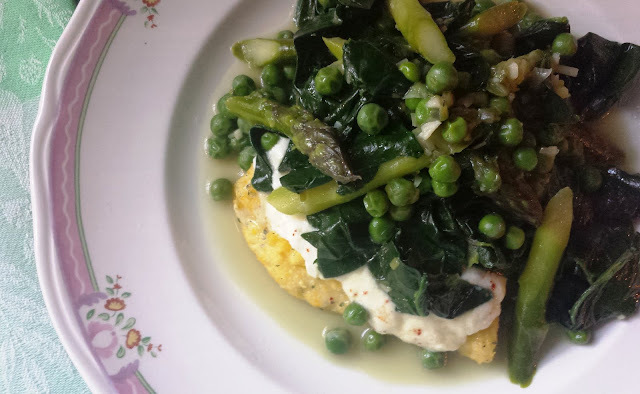 When the peas are tender, the polenta should be hot. 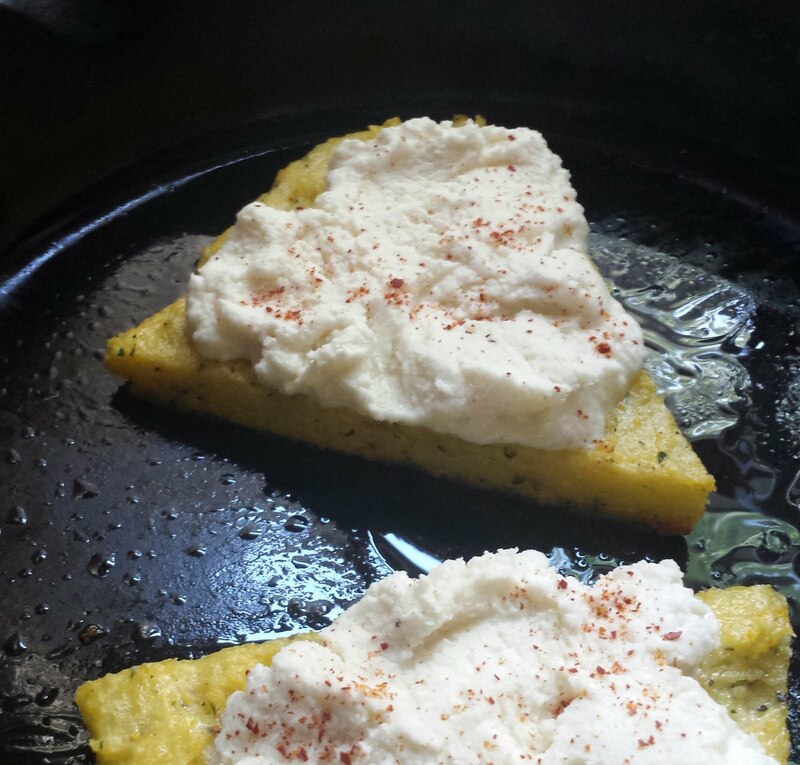 Remove the pan from the oven and smear the top of the polenta with the ricotta mixture. Set aside in a warm place while you finish the vegetables. Add the spinach to the pan of vegetables a handful at a time, turning to coat in the vegetables and broth as you do. Cook until the spinach is collapsed (and tender)—adding more water if you would like more vegetable broth. Taste and correct the seasoning. Stir in a drizzle of olive oil. Transfer the ricotta-topped polenta to a serving plate and mound the vegetables on over all, allowing some to drape over the sides. Pour any liquid remaining in the pan over and around. Bring a large pot of water to a simmer—this water will be used in the polenta and also as a bain-marie (double boiler) over which to cook the polenta. While the water is coming to a boil, place 1 t. salt in a 1 ½-to 2-qt. stainless bowl. When the pot of water comes to a boil, measure 3 cups of the water into the bowl with the salt. Using a whisk, stir the water into a whirlpool as you slowly pour in the polenta. Keep whisking in the same direction until the polenta is completely blended in and there are no lumps. Set the bowl over the simmering pot of water. Continue to whisk every few moments until you can see that the grains of polenta have begun to absorb the water and are suspended in the liquid and no longer settling in a mass at the bottom of the bowl. This should only take a few minutes. Cover the bowl with foil, sealing the edges securely. Cook for 1 ½ hours, keeping the water at a bare simmer. Occasionally uncover and stir the polenta with a rubber spatula—adding more hot water if the polenta becomes too stiff. Reseal the foil after each stirring. When finished, the polenta should be thick, soft & smooth and have no raw taste. It may be used immediately, made into firm polenta (see below) or held for up to 4 hours over steaming water. Add more salt and pepper to taste. Stir in the butter just before serving. To make Firm polenta, spread the finished (buttered and seasoned) polenta in an oiled dish in a 1/2 to 3/4-inch thick round or oval. Chill until firm. Cover with plastic wrap. Use within a week. Makes 6 to 8 portions firm polenta. Tried this tonight-my mom helped me -and it was SO delicious! We all loved it. (As always, your recipes are clear, precise and result in a delicious meal. I'm so glad you liked it!! Thanks for letting me know you tried it! Welcome to my blog. I'm a professionally trained chef and I work as a private chef and cooking teacher in the Kansas City, MO metro area. Cooking fills my days—whether cooking for a client, preparing for a class, or feeding myself, my friends or my family. If I'm not cooking or baking, I'm generally thinking about the next thing I will be cooking or baking. Visit Paige Vandegrift's profile on Pinterest.